My very first experience listening to the band might have included pressing play and patiently waiting for the lead singer to come out with his/her powerful vocals among the equally powerful electric guitar solos… patiently waiting, and waiting. But as the times goes by and you find yourself so into the flow of the music, listening to every riff and hit of drums – that initial need for vocals seem to fade. Well, Re-Stoned is not your average band – so the traditional set up fronted by a lead singer was instead replaced by the true craftsmanship of guitar, bass, and drums creating a fully instrumental experience. 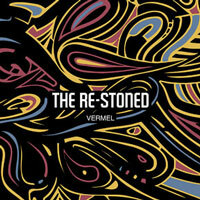 Vermel, Re-Stoned latest album, certainly brings us back to the golden style of the 70s classic rock, and with its world class hooks and true fuzzy rock the album definitely upholds the tradition of the decade well. The man standing behind the band, Ilya Lipkin, is a Moscow-based composer, guitarist and multi-instrumentalist who in 2008, together with a friend, Vladimir Nikulin, invited a drummer named Andrei Pankratov to form a rock trio THE RE-STONED, usually associated with the local “stoner rock” scene. But the band was formed to do more than that – it came to life as a way for the members to ‘re-turn to the music they always listened to, loved, and played’. In fact as some sources maintain the band is arguably the most welcomed and popular live act among the Russian classic rock revivalists. In essence the album is a captured lived performance recorded at the Vermel Club on August 19, 2010. It includes different versions of five compositions from the debut CD-album Revealed Gravitation, and two brand new tracks, “Jam” and “Return” – best when played LOUD. The release comes with no overdubs and certainly offers something fresh.